This is a very basic grilling recipe to get you started and comfortable with your grill. 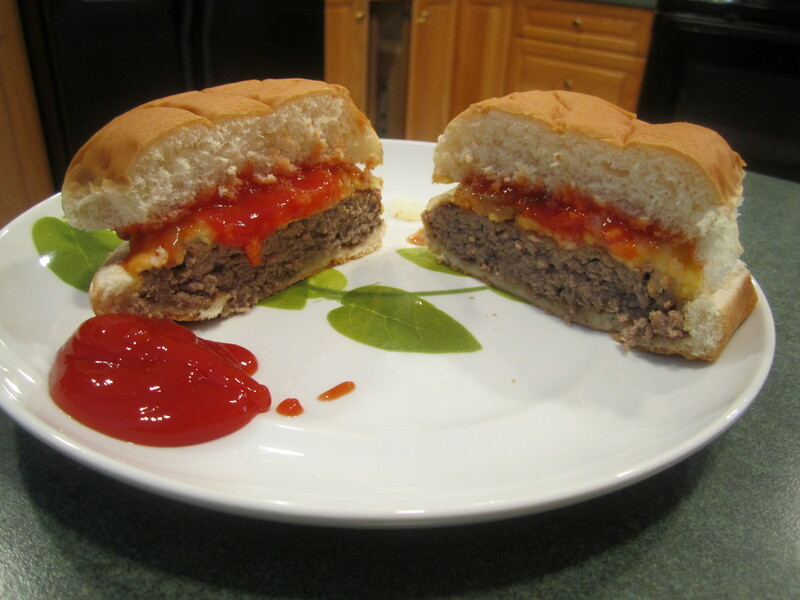 I make my own hamburger patties. I do not like the ones that you can buy premade. I like to control the size of my burger so it will fit my bun. So this size is specifically for Arnold’s Select Hamburger Buns. Tweek the hamburger patties to fit the size bun that you like. I also like 85% ground beef. 90% is too lean and 80% is too fatty for a burger. But this is strictly a matter of personal taste. Please buy what you like. What matters is the size and the cooking time of the burger. 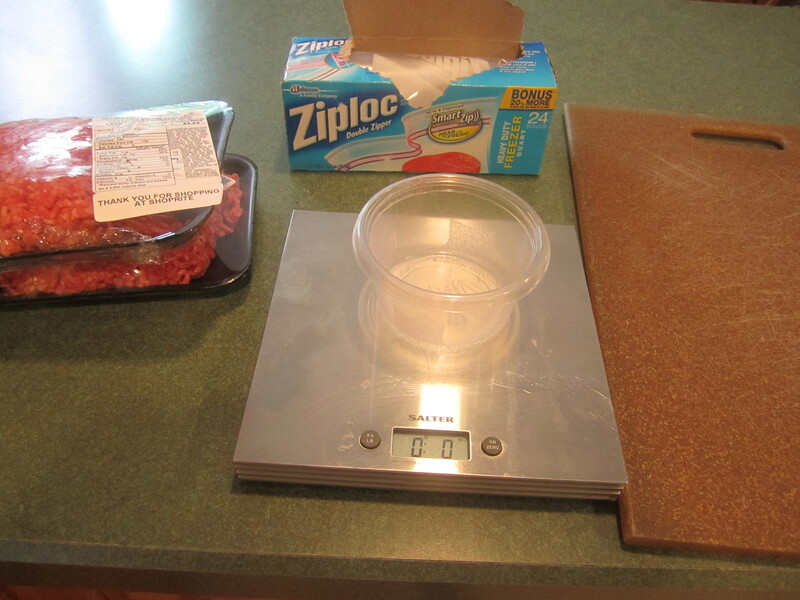 Using a 1 cup plastic ziplok container as a guide, fill the container with ground beef until it weighs out to 5 ounces (this does not include the weight of the container). 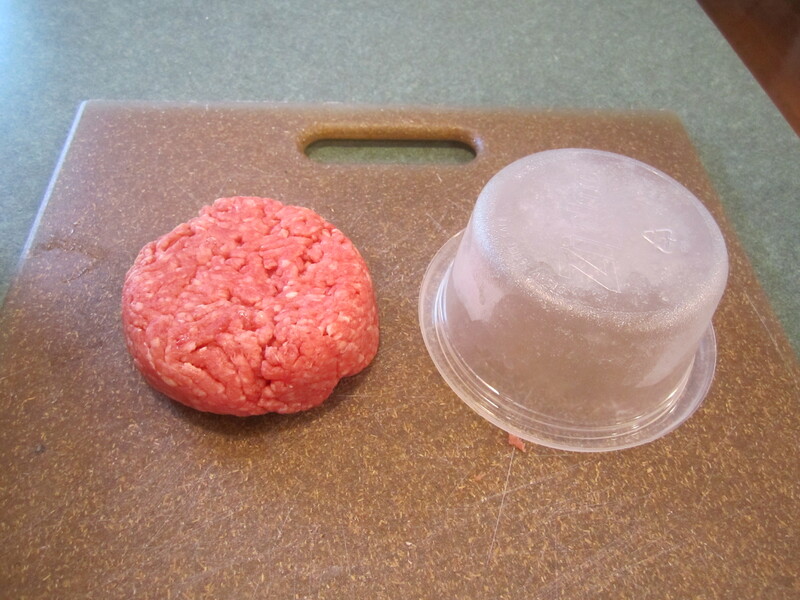 Press beef gently into cup. Turn it upside down and bang it onto a cutting board to release. 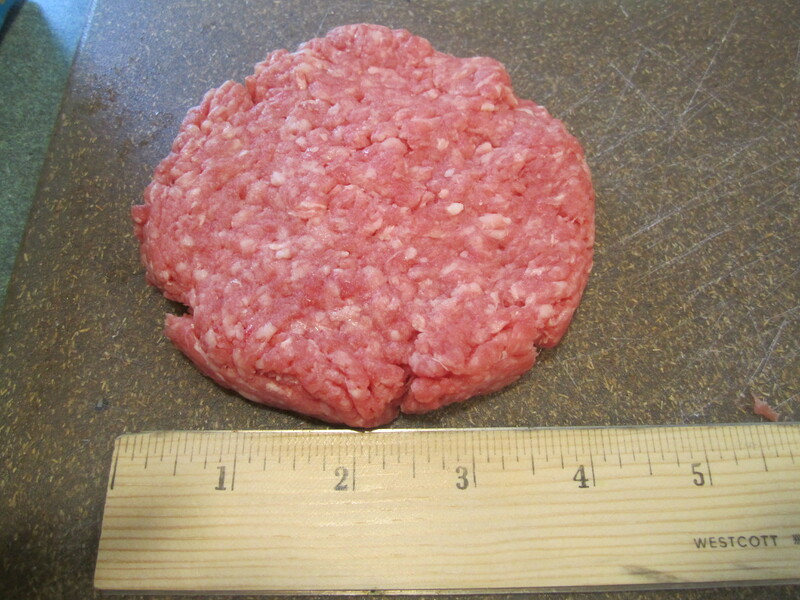 Gently press down on beef to make an ~4 inch wide, 1/4 to 1/2 inch thick burger. Gently with your fingers, loosen burger from cutting board and put back down, so it will be easy to take off when you are ready to grill. Proceed with as many burgers as you need. 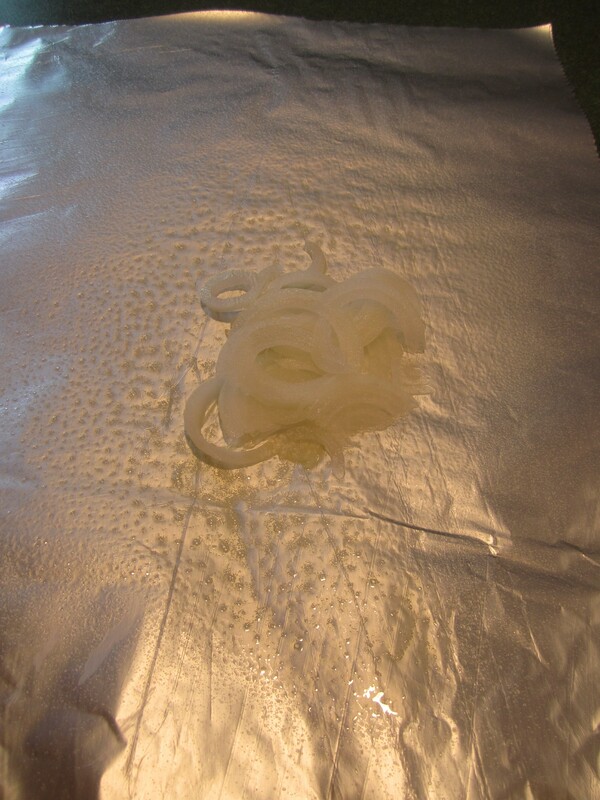 Place in refrigerator until you are ready to grill. 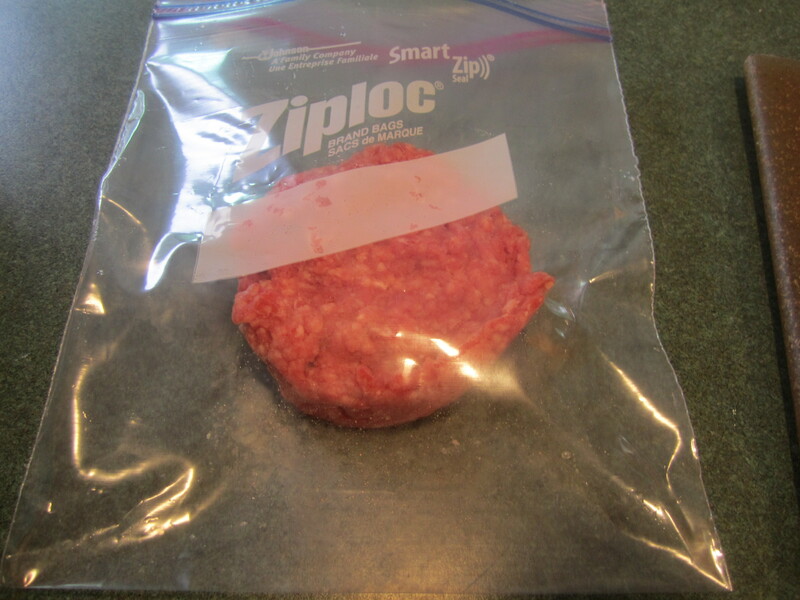 Instead of pressing down beef into patty on board, take the mound of beef and put into center of one quart ziplok freezer bag. 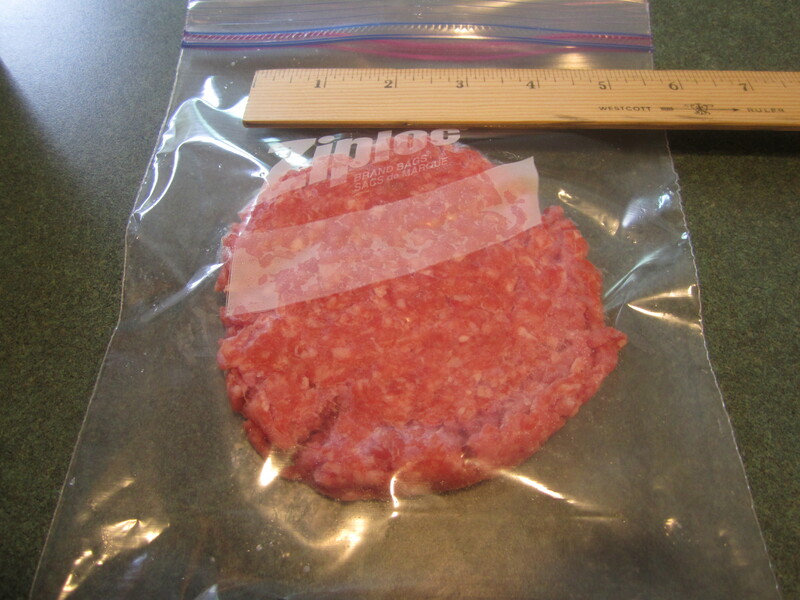 Gently press on bag to form into ~4 inch, 1/4 to 1/2 inch thick burger. Seal bag and place in freezer flat. Continue with the rest of beef. 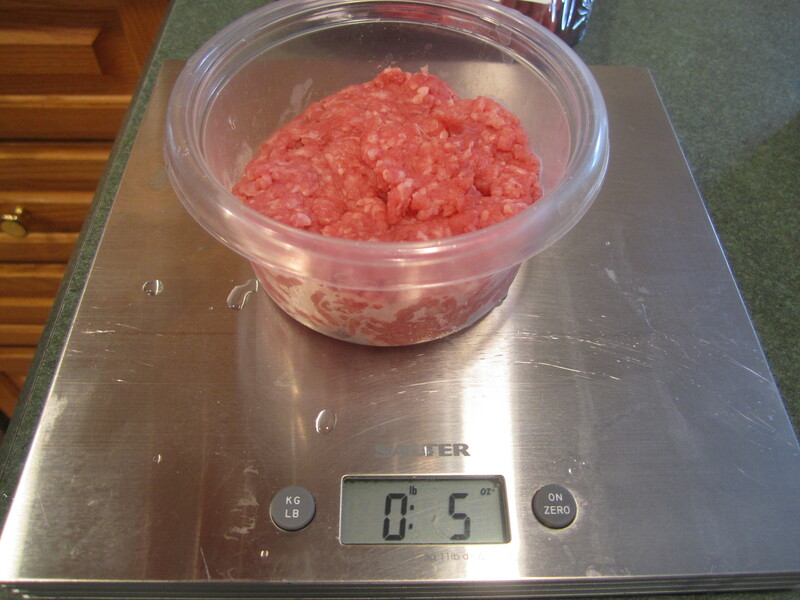 2 pounds of ground beef will make approximately 7 burgers. 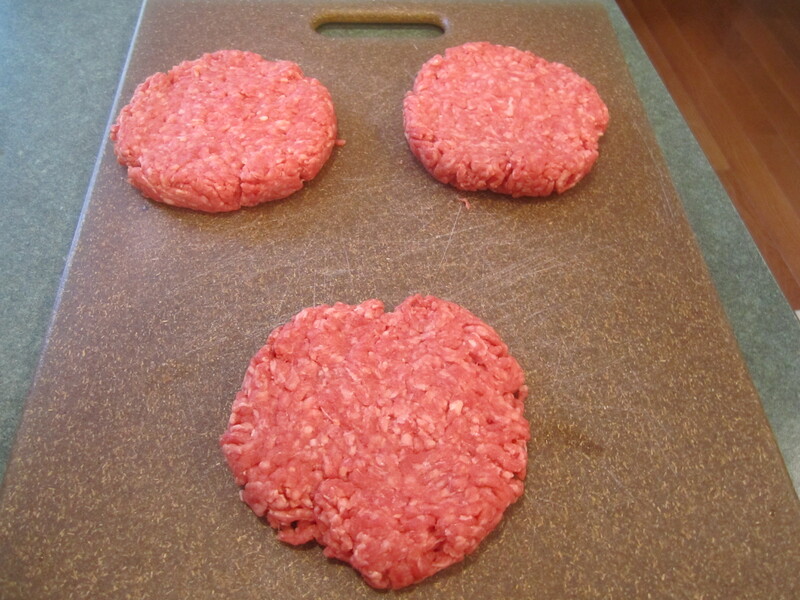 Just a side note, when you are all finished making your hamburger patties, clean ALL surfaces that have come in contact with the ground beef, with a disinfectant wipe. Cross contamination is no fun! 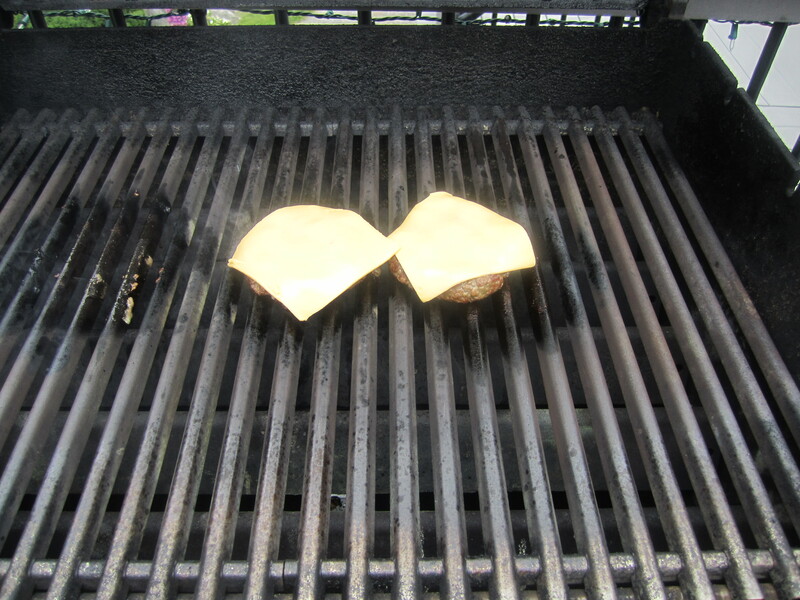 On my grill, this is the procedure: (but please read your manual FIRST! see Grilling post) OPEN THE HOOD (If the propane tank is not open, open it), put the front burner knob on high and ignite with the push button ignition. You should hear it ignite. Then turn the other knob(s) on high as well. You should hear them ignite too. Once all the burner(s) have ignited and you can see the flame (there is also a little peep-hole in the front of the grill, that when you look into, you can see the flames in the inside as well) close the hood and leave closed for 15 minutes. After 15 minutes open the hood and with your brush, clean the grates thoroughly. Sometimes I use the scraper part on my grill as well, to get everything off. It’s very important that the grates be clean. Your food could stick to the grate if they are not cleaned. 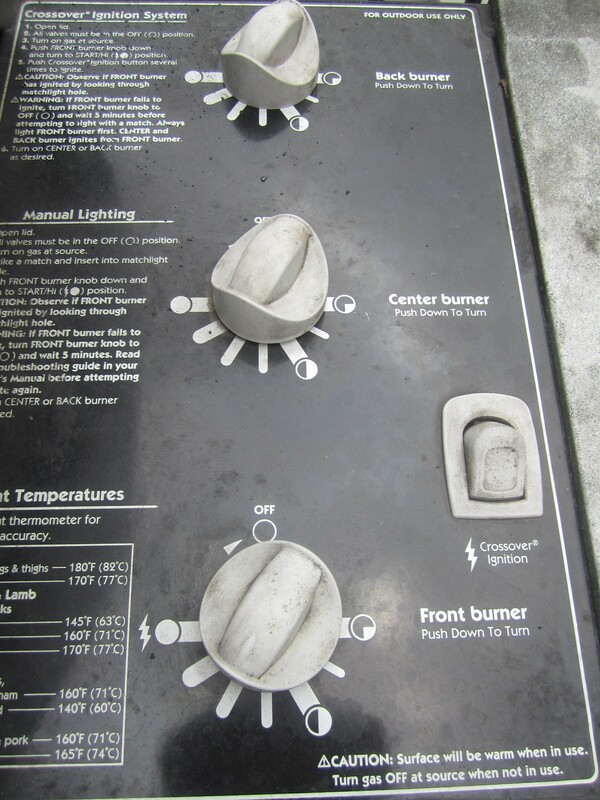 For fresh hamburger: set your heat on all burners to two notches below high. 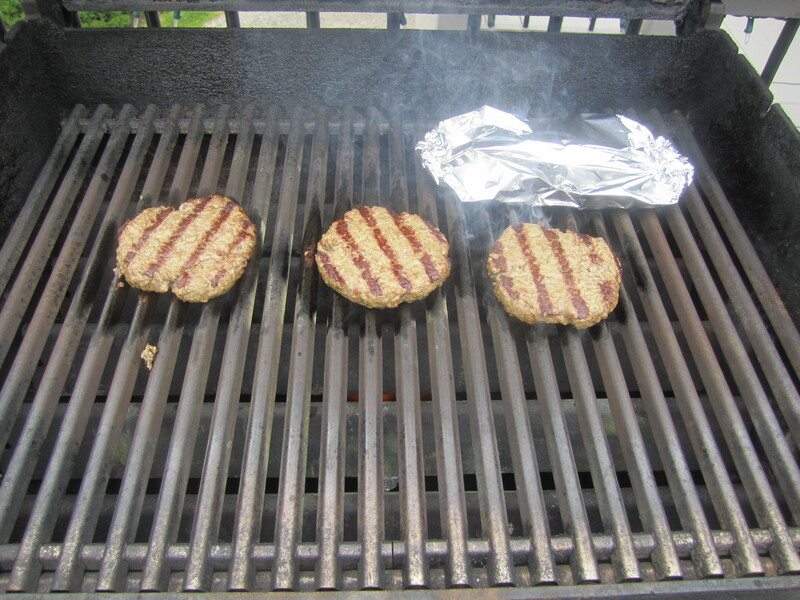 Set hamburger patties on clean grill. Close hood and set timer for 3 minutes. 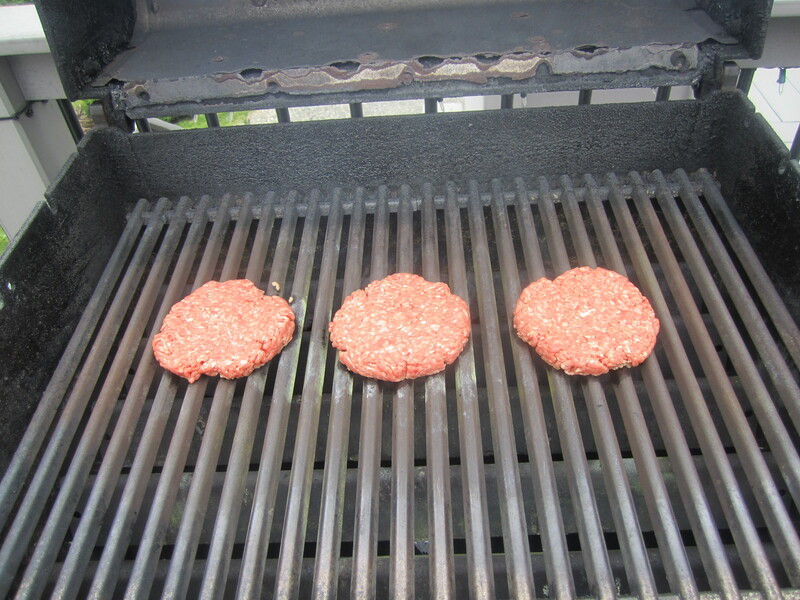 After 3 minutes, open hood, turn hamburger patties (this is when you would add your onion package**), close hood and set timer for 3 minutes. 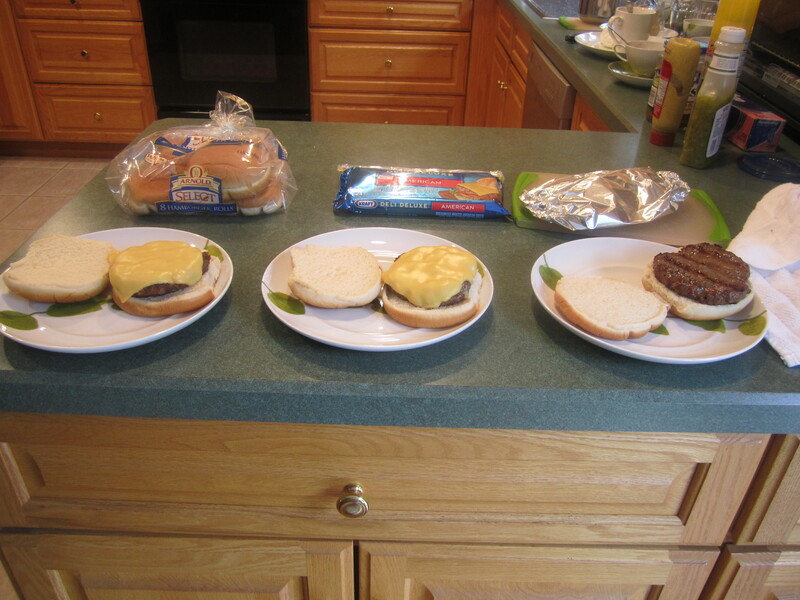 After time is up, open hood, put cheese on top of burger, turn off heat, close hood and wait for about 30 seconds. 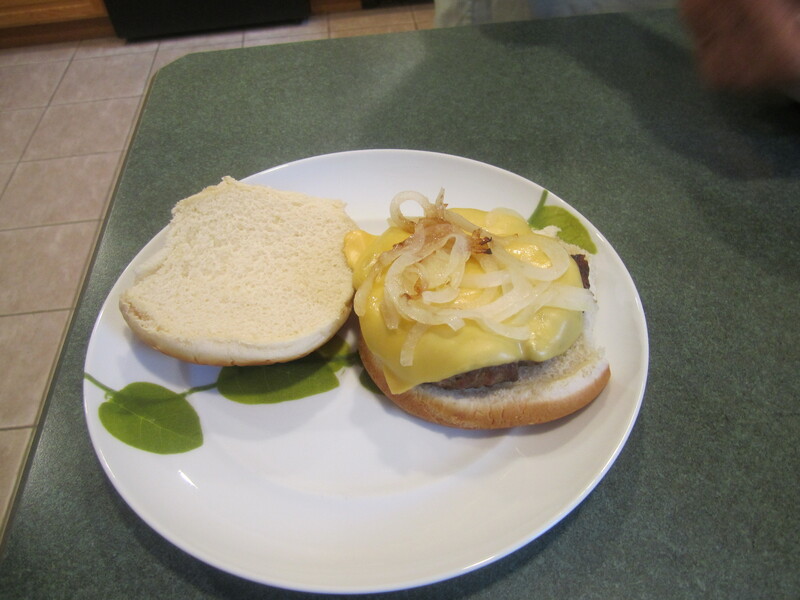 Open hood, remove hamburger onto bun and garnish as desired. 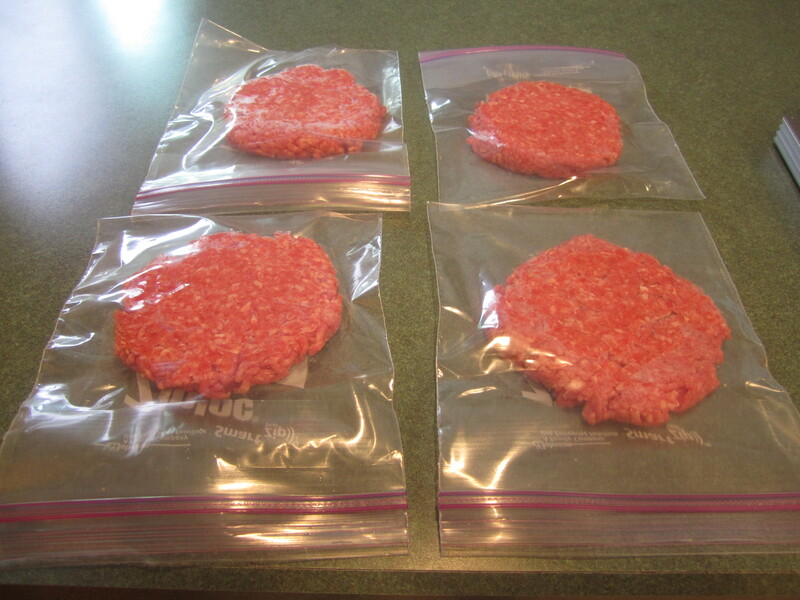 For frozen hamburgers, same as above but increase time to 4 minutes on each side. 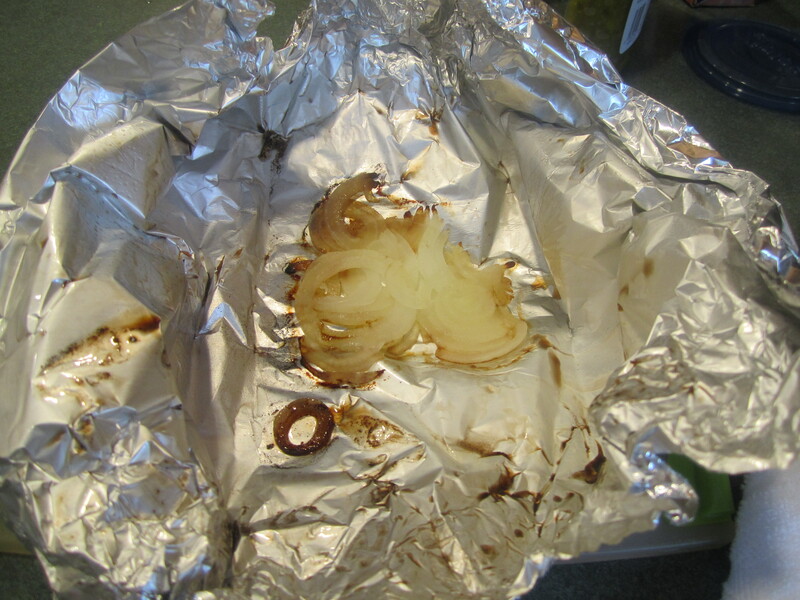 **If you like onions on your burger (this is enough for one possibly two burgers) : ~ 15 inch square of aluminum foil sprayed with canola oil, 1/2 of medium onion sliced thin and placed on aluminum foil. 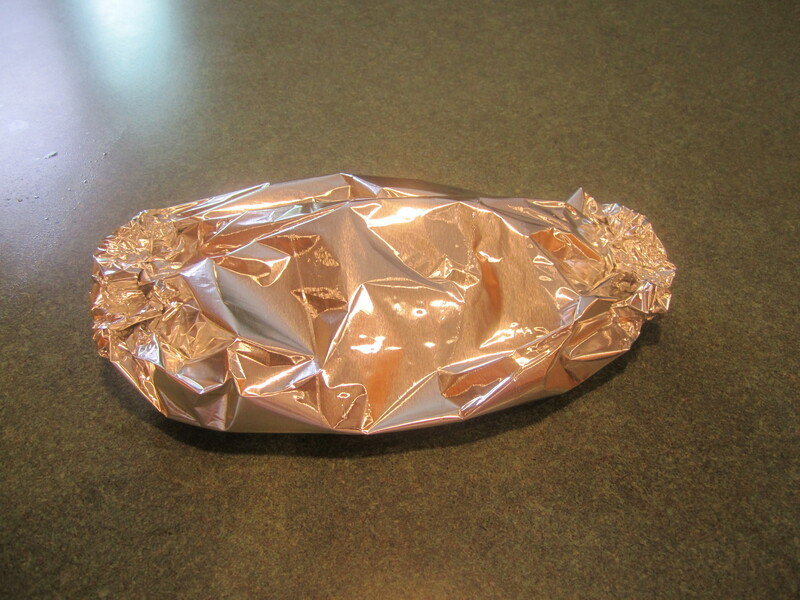 Fold up aluminum foil to make a puffy package.